W J O�Reilly�s video commentary on politics, education and the media are often seen on CNN. He is a partner of Harvard College�s Center for Public Interest Careers and a Professor of English at Touro College in NYC. 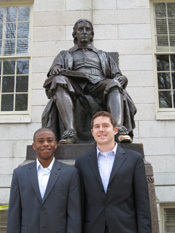 Standing beneath the statue of John Harvard, graduating Harvard Law School students Alexander Chester (r) and Darrell Bennett (l) made the case for the University's divestiture from Iran in the December 11, 2009 The Harvard Crimson. They then lobbied the 37 Harvard alumni who are members of Congress last February for their support. When Harvard pulls its endowment money or divests itself from companies that do business with nations that are on the wrong side of human rights issues�like the Sudan or South Africa in the days of apartheid�others watch, and they may well follow suit. Today, it is Iran�s nuclear brinksmanship which makes a persuasive argument for divestiture, and a group of budding lawyers, undergrads and alumni are pulling for just that. The group is hoping to push the University to divest from companies that do business with Tehran�s energy sector and slow the clock on its ability to produce nuclear weapons. That would be a good thing. At present, Morehouse College is the sole divestor from Iran among American colleges. Many believe Harvard�s divestiture will create the momentum that will produce a domino effect eliciting support among American and international universities. The initial cadre in the Harvard consortium has grown substantially since the group lobbied the 37 Harvard alumni who are senators and congressmen in Washington in late February of this year. Most were reportedly "enthusiastically supportive of divestment" and many have signed the letter which Harvard President Drew Faust is expected to be delivering to the all-powerful Harvard Corporation at its April meeting. Harvard has often been on the morally right side of divestiture---generally defined as an economic boycott, including stock liquidations, pressuring governments and even companies, to influence policy and even bring about regime change. Harvard led the pull of investments away from Petrochina in the Sudan as a rebuff to confirmed acts of terrorism and genocide against the people of Darfur. Once Harvard had stepped into the breach and committed to pulling funds from a government it considered morally corrupt, many American colleges and universities followed. "The Harvard name carries very far, for good--- and for ill," notes Iran divestment proponent and Harvard Law student Alexander Chester. Iran�s atomic ambitions apparently became more ill-intentioned, especially as President Mahmoud Ahmadinijad set his sights beyond the 3.5 percent threshold necessary for electricity generation. Its enrichment is seen as a slap in the face of UN Security Council Resolutions 1696 and 1737 demanding a halt to enrichment altogether. "Iran must comply with international resolutions on nuclear energy, and our efforts are a direct response to this," consortium member Daryll Bennett underscored. Law School students Bennett and Chester penned "Time to Explore Iran Divestment" in December 11, 2009�s The Harvard Crimson, challenging the community of Harvard to find appropriate response to Tehran�s recklessness and to "consider what role it might play in helping to avert an international crisis" in an already incendiary region of the world which cannot even vaguely support the introduction of nuclear weapons. CAN HARVARD REDEEM ITS DIVESTMENT DELAY IN SOUTH AFRICA ? Some argue that Harvard suffered a stain on its legacy by not moving decisively to divest from South Africa In the anti-apartheid era. In the late 70s and 80s Harvard seemed mired in philosophical debate over whether or not it should withhold funds from Pretoria. Many Harvard students and faculty at that time were in favor of full divestment, but had to settle for "partial" divestment because of then university President Derek Bok�s argument that the free world would best help to change apartheid by speaking out as shareholders in corporations that did business with the racially-biased country. This time, the consortium believes, Harvard must be "on the right side of history" and make whole its human rights legacy. To bring the significant influence of the US government to its cause, consortium members met with 25 of 37 Harvard alumni in Congress and the US House of Representatives, all of whom had supported the Iran Sanctions Enabling Act. Most have signed the letter that is expected to accompany President Faust in her meeting with the Harvard Corporation next month. Harvard alumni lobbied were Sens. Al Franken (D-Minn.), Herb Kohl (D-Wis.), David Vitter (R-La.) and Mark Warner (D-Va.), as well as Reps. John Barrow (D-Ga.), Gerald Connolly (D-Va.), Jim Cooper (D-Tenn.), Artur Davis (D-Ala.), John Garamendi (D-Calif.), Jim Himes (D-Conn.), Ron Kind (D-Wis.), Jim Langevin (D-R.I.), Walter Minnick (D-Idaho), Scott Murphy (D-N.Y.), Tom Petri (R-Wisc. ), Adam Schiff (D-Calif.), and Chris Van Hollen (D-Md.). "We�re not na�ve enough to think that withdrawing part of its endowment alone will deter Iran from pursuing nuclear weapons," Chester noted. Still, there is reason for optimism in the recent withdrawal of Royal Dutch Shell from Iran after 20 US states pulled the energy stock from their pension plans. If Harvard votes to divest and other universities follow, the action might "serve as inspiration for the young people we saw last Spring on the streets of Tehran�putting life and limb on the line to protest for democracy and against the policies of the regime, including the pursuit of weapons of mass destruction," he said.